This is an informal interview with Francisco Porcella, after one of the most epic sessions of the season in Nazaré. Professional Big Wave Surfer, Francisco Porcella, was involved in a spectacular rescue operation with a jetski in Praia do Norte, during a dramatic big wave session on December 22, 20126, with waves reaching 40 feet faces on the Outside. Locals, called this session “The Heavy Thursday” and recall it as one of the best sessions of 2016 in all terms. After riding several big waves and having himself suffered one of the worst wipeouts of the session on a massive bomb shared with Lucas Chumbo, Porcella paused his surf and started doing safety operations, he then used the jet ski to rescued his team mate, Axi Muniain after a massive beating from a set wave that almost knocked Muniain unconscious. While Porcella was helping Muniain, the jetski was hit by a wave and flipped, putting both Porcella and Muniain out of the jet ski and drifting into the dangerous inside area of Praia do Norte, the jetski hit the rocks at this point. They were both picked up by other jetski, Axi Muniain got safely to the beach with minor injuries. While Porcella jumped from the jetski, he then tries to save the other jetski that was being pushed into a cave, and ultimately got “parked” inside the cave. Francisco Porcella and Axi Muniain were both safe after this accident, suffering just minor injuries and a quick visit to the hospital, the jet ski was also recovered by Porcella minutes later this incident. The drone footage was obtained by “Máquina Voadora – Produções”, a specialised drone team operating in the area while shooting the big wave surf action for the day, Daniel Neves was operating the drone; the Land Footage was produced by world renowned and local videographer Nuno Dias; and the interview was made by Pedro Miranda a local photographer and big wave enthusiast also involved in the drone operation. 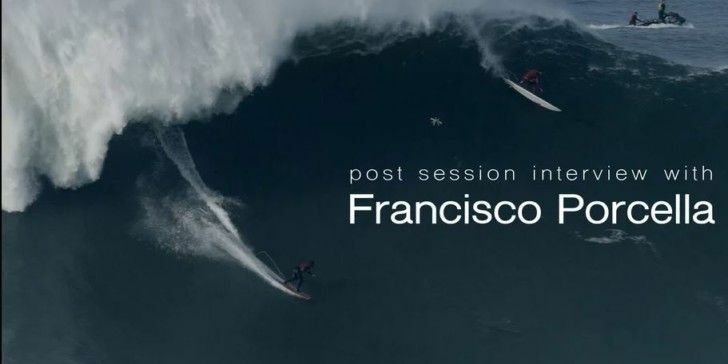 Post Session Interview with Francisco Porcella – Nazaré – 2016.12.22 from Máquina Voadora on Vimeo.